with special attention to the Arabian Peninsula, and a method to significantly increase water resources of the area. Choices for the Arabian peninsula -- arid or abundance? Right: Salalah in Sultanate of Oman, photo used by permission from Oman Attractions. Portions of this article were originally published as "How Revegetation Can Reduce Global Warming" in the Planet Drum Pulse (2002) Winter, pages 1-2. Planet Drum Foundation, San Francisco, CA., and translated into Portuguese "O Plantio de Vegetação pode Reduzir o Aquecimento Global" The Ecologist Brasil (2002) Inverno 5: 38. The world's attention has been focused on the politics and geologic resources of a strip of desert land from the Arabian peninsula eastward to Western India. What about the health of the ecosystems and rainfall patterns of that region? Could the health of the native perennial grasslands of this region in particular, have planetary implications for the rest of us? This is the story of the humble perennial grass plants, that originally formed a savanna over these desert areas, until 5,000 to 6,000 years ago. Pollen records and dust records from the Arabian peninsula (Van Campo et al, 1982; Sirocko et al, 1993) and most recently, ice cores from Kilimanjaro (Thompson et al, 2002) record an abrupt change from wet to dry. Humans in this area went from a Neolithic hunter-gather life, about 5,500 years ago, to settling in city-states, with agriculture and widespread grazing of domesticated cattle, sheep and goats. The cattle ate the perennial grasses and the goats and sheep ate everything else. By 4,700 years ago, everything from Morocco to Western India was converted from perennial grasslands, to desert. There is a statue that records this vegetation change, one copy in the University of Philadelphia and the other in the British Museum: "Ram in the Thicket". Made in Ur, Mesopotamia (modern Iraq) 4,700 years ago, it shows a ram reaching high into a thicket to eat some leaves. This statue may be one of the only examples of human-induced environmental change incorporated into art. This statue shows an environment, where all the ground-level forage has been stripped off the land for many years, all the palatable shrubs are gone, only leaving thorn bushes, with even their lower branches have been stripped bare. Archeologists are not sure what the ram statues signify, but they suspect it was something religious. Perhaps it could have been an ancient prophesy: "When the ram reaches high to eat the leaves of the thorn bushes, your civilization will be destroyed"? The rams did eat the thorn bush leaves, and Ur was destroyed. The stripping of the vegetation and subsequent desertification forced the hunter-gathering lifestyle to be completely abandoned in Arabia by 5200-5600 years ago (Thompson et al, 2002). The largest bare areas today are the 300,000 square miles of the southern portion of the Arabian peninsula is called Rub Al Khali or "The Empty Quarter", and everyone has heard of the Sahara desert. Plus a new bare portion has been forming from recent droughts, that stretches from Western India through Afghanistan. Looking at photographs of the first civilizations of this area: there is nothing at these ancient sites today, just ruins, rocks and sand to the horizon, no humans or even a speck of green vegetation of any sort. Look at photos of Ur in Iraq, Palmyra in Syria, or Pasargadae in Iran. All this bare ground causes dust storms, which an estimated 260 million tons is blown annually into the Atlantic ocean from the Sahara alone (Van Campo, 1982). On a global scale, all that bare ground getting hot by the sun, is blocking the world's precipitation cycle. The five thousand years of grazing of North Africa and the Middle East has left about five billion acres mostly bare of any vegetation--that constitutes about 15% of the planet's total land area, if you exclude Antarctica and Greenland. The world's clouds mostly start out as moisture coming off the Antarctic ice sheet. They circle eastward hugging the Antarctic coast, until they get just east of Australia, when they move north to the equator, then westward along the equator to China. At China and Japan, a portion breaks north that eventually ends up along the coast of Alaska and then moves southeastward to rain on California in the winter, but the major portion keeps traveling westward and creates the monsoons in India in the summer of the northern hemisphere. What happens when the sun hits the bare soils of the strip from Western India to the Arabian peninsula, is that there is no longer any perennial grasses to insulate the rocks and soil from absorbing the heat of the sun. If the shade temperature at noon is 90°F, the top inch of bare soil can be 126°F versus only 88°F when only one small perennial native grass plant growing. The Mojave's Desert Stipa of the Californian desert (Achnantherum speciosum), shows nearly a 40 degree difference, below. Above: "Six miles south of Palmdale, on September 27, 2000 at noon a California native Harvester ant finds the coolest Mojave soil temperature underneath the perennial native Desert Stipa grass plant" Copyright © 2000 by Craig C. Dremann. Temperatures are in Fahrenheit ± one degree, measured 0.25" (6 mm) below the soil's surface. Grid is in inches. The plant's diameter is nine inches by eight inches, and the cooling effect of the plant includes the dense shade cast upon the desert's surface. The bare rocks and soil absorb the sun's heat, which in turn heats the air, which in turn creates an area of with a very low dew point. When the heat of the sun is absorbed by the exposed rocks and sand, the heat is carried a long way underground, like heating a skillet on the stove. When there is dust in the atmosphere, it traps and holds the heat longer. When water moisture is in the air that could produce rain, moves towards these hotter, bare areas, the heat and the dust keep clouds from forming and the rain cannot precipitate out of the air, when the dew point is too far from the air temperature. Above: Univ. of Wisconsin's web site shows land and ocean temperatures at http://www.ssec.wisc.edu/data/comp/latest_cmoll.gif . The blockage of the monsoonal rainfall can be seen, the heat from the bare soil and the atmospheric dust keeping the clouds offshore.. Image above shows a typical summer monsoonal pattern for the last 5,000 years, where the heat from the bare soils and atmospheric dust stops the monsoonal clouds from forming over the Arabian peninsula. The global moisture conveyor-belt stopped in western India, Afghanistan and the Arabian peninsula during most of the summers of this decade , causing floods in Southeast Asia and central India when the moisture is blocked by the hot soil surface temperatures. If an annual investment could be made, to revegetate large area of the Middle East, with their own local perennial native grasses and savanna-tree (like the native Acacias), the global moisture conveyor belt would continue across the Equator, through Africa, to bring rain to the Middle East and eventually, the farms in the Midwest and Southwest United States. The Arabian peninsula's pivotal location, could become the "stepping stone" to allow the monsoon moisture to move westward each summer, if the perennial native grasses and savanna shade-trees were replanted. Left: Shows the line where the western movement of the monsoon moisture is blocked, May to September each year. Right: Producing cooler soil temperatures in summer with revegetation of the bare soils, and lowering the atmospheric dust, could help the monsoon moisture to rain over the Arabian peninsula, as it did regularly 2,000-6,000 years ago. SALALAH, OMAN as the example. The cool-soil conditions created by perennial vegetation, that produce rainfall from the summer monsoonal moisture, still occurs in the mountains north of the city of Salalah Oman. Photo copyright © Oman Attractions, used with written permission. The vegetation of the mountains above Salalah that creates the rain each summer, can barely be seen from space, seen as a very thin green line along the coast of the Sultanate of Oman. This shows how a relatively tiny amount of vegetation can radically change the rainfall patterns of an arid area. See more pictures of Salalah at http://www.ecoseeds.com/salalah.html of the remarkable and dramatic connection between vegetation and rainfall. THE ANCIENT TRACK of moisture across the Arabian peninsula does not show up as clouds, but the water vapor still follows the 6,000 year old rain-path. The moisture going over Arabia every summer is now extremely suppressed by the hot, bare soils and atmospheric dust. Example from July 20, 2010 of the ancient track of monsoonal moisture for a brief time, forming clouds across Arabia again after 6,000 years. HOT BARE SOILS and the atmospheric dust of the Arabian peninsula has such a strong effect to block moisture, that the category-5 super Tropical Cyclone Gonu could not make landfall in June, 2007, and was bottled up in the Gulf of Oman for several days instead of moving inland. EVEN AT CATEGORY-5 strength, Tropical Cyclone Gonu at 155-195 mph, was not strong enough to break through the atmospheric dust barrier covering Arabia in June 2007 (NASA, Earth Observatory). Two major Arabian peninsula rivers that could start flowing again, and two huge lakes that could start storing water again. River #1 was 650 miles long, and averaged 5 miles wide and 50 feet deep along its entire length, was studied by Boston University scientist Farouk El-Baz in 1993. (DISCOVER, July 1993 "A river in the desert"). Giant Lake, originally 100 meters deep (300 feet) can clearly be seen from Google Earth images. especially the "Figure 11 - Pleistocene drainage of Arabian Peninsula." (4.) Philby, H. St. John B. 1933 book "The Empty Quarter: Being a description of the Great South Desert of Arabia known as Rub' al Khali" (pub. Henry Holt & Co. NY) on his chapter "Forgotten Rivers" and finding river beds with fresh-water shells. .The Empty Quarter's huge river bed and falls, showing massive waterflows in the middle of the Empty Quarter at 18 deg.08'24.10"N, 45 deg.25'05.88"E, on Google Earth. Blue-white color are from the minerals in the river water that dried on the surface, when the river stopped flowing. The Empty Quarter's lake beds, according to McClure, are distributed down the middle length of the Rub' al-Khali" - a distance of some 750 miles (1,200 kilometers) and bones of hippopotamus, water buffalo and long-horned cattle, wild asses, wild goats or sheep, oryx, gazelle, and possibly camels and hartebeest, as well as fresh water clam shells, have been found in the ancient lake mud. Written records exist, describing rivers in Arabia flowing in historic times. In 430 BCE, Herodotus in "The Histories" Book III mentions a "great river in Arabia, called the Corys". Later, the historian Strabo in 22 CE in "Geography" Book XVI tells about the Roman expedition in Arabia of Aelius Gallus arriving at a river in the middle of the desert, and describes the southwestern part of Arabia with enough rain in the summer to produce two crops a year, and reports that rivers were flowed into lakes. Photo from 22 N latitude 54 E longitude, ancient 6,000 year old lake bed, surface is the dried minerals from the water, with the water originally higher than the dunes in the background, over 100 meters deep (300 feet). Image from the Confluence.org project, used with permission. 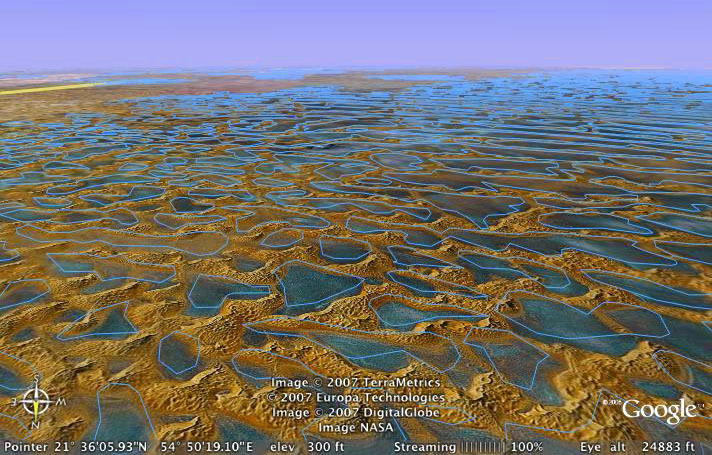 Ancient 6,000 year old, Empty Quarter lake bed, seen from 30.6 miles, Google Earth image. Looking from the UAE across KSA into the Sultanate of Oman. The former perennial grassland areas of the Kingdom of Saudi Arabia, along with portions of Yemen and the Sultante of Oman, called "desert rangelands" cover about 76% of the KSA, or 419 million acres (1.7 million square km.) (AbuZinada, 2002)--and then there are rangelands in the adjoining countries, like the Sultanate of Oman and Yemen, which could be restored to their former abundance. Natural ecological restoration of a large part of the Arabian peninsula, especially the areas where the bare soils are producing the bulk of the atmospheric dust, that keeps the summer moisture away, would be the easiest method to get the rains to start falling again. 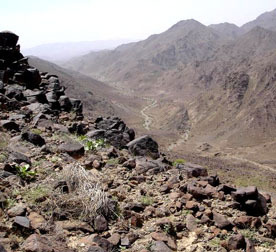 The Arabian peninsula on average only receives four inches (10 cm) or rainfall per year, but relic plant species in the area's flora, indicate that it should be possible to increase the annual rainfall to at least ten inches (25 cm) as a reasonable goal, and perhaps as much as 25-40 inches (60-100 cm) could be achieved. This increased summer moisture could start rivers flowing again that haven't flowed for 2,000-6,000 years, filling the wadis again with flowing water, and could help lower the annual summer maximum daytime and night time temperatures for the countries of the peninsula, perhaps 10-20 degrees F lower. A portion of the 419 million acres of the desert rangelands, could be an ideal location for the world's largest Ecological Restoration Preserve, a project to reduce global warming, and to help increase the annual rainfall and increase the water supply of Arabia. Perhaps this would be the best spot on the planet to start the conversion of the desert--which is currently mostly dwarf-shrub steppes and annual grasses--back to its original perennial native grasslands, and get the desert rivers flowing again? The native grasslands of the Arabian peninsula were studied by Professor Harold F. Heady, a grasslands expert from the University of California at Berkeley, as a consultant for the UN Food and Agriculture Organization in 1962. Traveling over 3,500 miles (5,758 kilometers) by automobile, he found remnants of the Arabia's original perennial grasslands, like the Panicum turgidum shown above. REPLANTING THE NATIVE GRASSES and NATIVE TREES to control monsoonal floods. Replanting the native perennial grasses and trees like the Acacia, could help stop or slow down the potential monsoonal floods that may hit the Arabian peninsula, and other parts of the Middle East in the near future. The monsoonal moisture broke through the 5,000 year old barrier created by the atmospheric dust and heat in July and August of 2010, and caused massive floods in Pakistan. With global warming as a new active variable, the monsoonal moisture may return to the lands of the Arabian peninsula and other parts of the Middle East, much sooner than expected. Southern and central Arabia are directly in the path of all of that monsoonal moisture each year, and the only reason it does not rain, is because of the atmospheric dust and lack of vegetation creating the hot bare soils--but as you can see in Pakistan in 2010, the moisture now has the power to overwhelm that blockage in a flash. With the 5,000 year old monsoon moisture barrier weakening, the annual rainfall for the Arabian peninsula is likely to increase rapidly, to up to one meter of rain a year or more during the May to November monsoons. That rainfall could occur in huge rain events, like in the past, as evidenced by the huge 100 meter deep ancient lake, along with the monster river and waterfalls in the Empty Quarter. TORRENTIAL RAIN and FLOOD events, prior to 1985, were extremely rare on Arabian peninsula. Michael O. Walter (1989) wrote a paper "A unique flood event in an arid zone." in Hydrological Processes, 3: 15-24 about the April 23, 1985 flood event in SW of the Kingdom of Saudi Arabia that killed 32. Walter estimated at the time, that flood events in Arabia were only expected to happened every 200 years or so. Since 1985, flash flood rain events with property damages and deaths have become annual events, or sometimes can be monthly summer events in some years, as the torrential monsoonal moisture breaks through the 5,000 year old dust/heat barrier, as shown in the following list (KSA = Kingdom of Saudi Arabia, Oman = The Sultanate of Oman). 1986-1991 - All Arabian Sea tropical storms dissipated before making landfall on the Arabian peninsula. 1992 - October 3=Oman, Cyclone Storm ARB 03, 50 mph. storm hit eastern Oman, with no deaths and no damages. 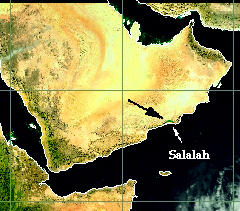 1994 - June 5-9=Arabia sea, Severe Cyclone Storm ARB 02, dissipated over Oman with no deaths or damages. 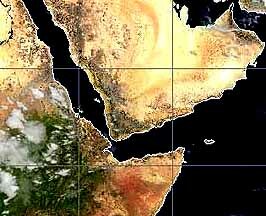 1995 - October 11-18=Arabian sea, Tropical Storm 02A, dissipated over the sea, before striking the Arabian peninsula. 1996 - June 10-12=Oman, the Tropical Storm 02A, total rainfall 300 mm (12 inches) and was the first rainfall from a cyclone in that country for four years, two deaths and livestock losses occurred. 1997 - No tropical cyclones. 1998 - Dec. 17=Oman, the Severe Cyclonic storm ARB 06, made landfall with winds 65 km/hr. and dissipated that day, no damages. 1999-2001 - No tropical cyclones. 2002 - April 8-13=KSA, Mecca floods. May 10=Oman, Salalah (Cyclone storm ARB 01) floods, heaviest rains in 30 years, creating rivers in the wadis, damages total $25 million.. July 6-8=Yemen torrential rains. July 24-26=Yemen floods. August 22-Sept. 6=Yemen floods. 2003 - April 14-19=Oman flash flood. November 10-11=KSA flood, strongest rain in 25 years. 2004 - Jan. 12-21=Yemen floods. April 8=Yemen, heavy rains for several days. April 14=KSA, road, houses, bridges destroyed. August 3=KSA worst floods in 45 years, inundate 40 valleys. 2005 - Jan. 22-27=Medina KSA, worst torrential storm to hit Kingdom in 20 years. March 1-23=Riyadh, Oman and UAE floods. 2006 - Feb. 1=KSA, Jordan floods. February 20-23=Yemen flood. April 3-5=Yemen flash floods and torrential rains. 2007 - Jan. 1-7=Yemen floods destroys 600 homes. Feb. 13=Riyadh, KSA rain event. March 5=Kuwait flood. March 23-30=Yemen flash floods. June 6=Oman flood (Super Cyclone GONU) $4.2 billion damages, 24 inches (60 cm) of rainfall, 162 mph (260 km/hr.) winds before landfall, 78 died. Aug. 1-27=Yemen floods. 2008 - Jan. 15=UAE flood. Oct. 23-24=Yemen flood (Tropical Depression ARB 02/TC 03B) 1700 homes destroyed, 184 died, and $1 billion in damages. Nov. 9=KSA flood in major cities. 2009 - Nov. 24-26=Jeddah floods, 3.5" of rain in a day, where there is only 2.2" annually. 2010 - January 18-21=Eastern Egypt, worst flood in a decade, sweeping away 700 homes and uprooted 27,000 trees in orchards. May 3-6=Riyadh KSA and Yemen floods. May 21-22 Yemen island hit by Tropical cyclone Bandu, destruction of many homes. June 4=Oman (Tropical cyclone Phet) major flooding, 11.8" of rainfall and 125 mph (200 Km/hr) winds, $780 million in damages. July 13=KSA torrential rain. July 10-15=Yemen and KSA Jeddah flash floods. July 23-25=KSA flash floods. July 15-August 30=Pakistan floods, 10 inches rain in 24 hours in places, 2 million homes destroyed, submerged 17 million acres farmland (Wikipedia). Tropical Storm Keila hitting Oman on November 2-4, 2011. Image from MODIS. 2011 - January 15=Jeddah received 41.7mm (1.5 inches) of rainfall in four hours. January 26=Jeddah floods with 111 mm (4.3 inches) rainfall, 10 people died. July 27=Pakistan, massive Indus river floods again, kills 199, damages one million homes, impacts five million people. August 29=Southern KSA and eastern Yemen, flooding rainfall. September 5-13=Pakistan, massive Indus river floods again. 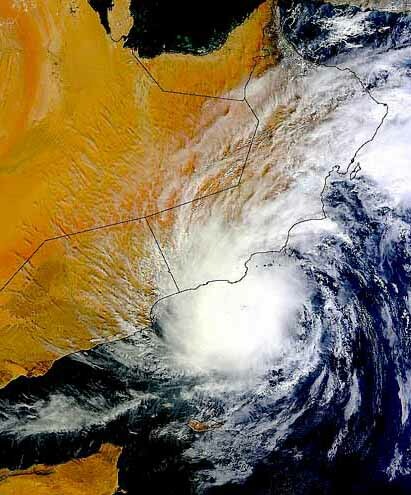 November 2-4=Oman and Yemen, Tropical Storm Keila was able to move the atmospheric dust aside along the coast of Oman, and produced torrential rainfall. Winds 63-119 km/hr., raining up to 50 mm (2 inches) per hour in places that turned streets into rivers, killing 14 people, 200 injured, and causing at least $50 million in damages. November 8-10=Oman, Tropical Cyclone Four/ARB03, torrential rains along the coast of Oman and the atmospheric dust covers the Arabian peninsula and keeps this storm from going too far inland, no damages, no injuries. November 26-30=KSA heavy rainfall in eastern portion of the country. Cyclone 05A forms and the atmospheric dust over the Arabian peninsula keeps it offshore of Oman, where it dissipates, no damages. This is the fifth cyclone to visit Oman in only four years. 2012 - April 11-18=Southern KSA and the Empty Quarter, Aseer province, heavy rain, flooding, wind, hail, snow, killing 18, 12 missing. The story from Alarabiya with picture of street floods at http://english.alarabiya.net/articles/2012/04/12/207189.html. This weather is called unprecedented, but is the result of a new subtropical cyclone and storm track coming from Brazil moving eastward across the Atlantic to Arabia, that is described below. Also in Oman six killed by floods in wadis. July 22=Lahore, Pakistan, streets flood from heavy monsoon rains. 2013 - January 27-29=KSA Tabuk, floods caused by a new storm track coming from the south, from the East coast of Africa. March 21-26=KSA southern Jazan province, three swept away in floods (Saudi Gazette) http://www.saudigazette.com.sa Several roads were flooded or damaged in heavy rains that lashed Jazan region, again from the new storm track from Brazil, and Yemen reports six people died in Hadramout governorate, with the Dawan, Wadi Al-Ain, Al-Qatan, Shebam, Tareem, Sah and Sayoon areas were all partially under water due to the floods. Roads in Al-Soairi and Moshtaa areas are still blocked (Yemen Times). In 2013, new spring storm tracks are bringing floods to the Arabian peninsula, filling valleys with flood waters, in the wadis that have not seen flowing waters for centuries. NEW SUBTROPICAL CYCLONE STORM BELT in March-April 2011 forming off Brazil... and headed straight for Saudi Arabia. Earthweek reports at http://www.earthweek.com/2011/ew110318/ew110318e.html that a new subtropical cyclone belt may be forming off the coast of Brazil in March and April, perhaps as the result of global warming. UPDATE APRIL, 2012. New spring Arabia flood rainfall pattern, coming from South America to Arabia. This new track is already putting enough water into huge lake bed in the Empty Quarter, that the changes can been seen by NASA satellite photos. The following is a NASA report of the event, where Torrential rains caused flooding in parts of Saudi Arabia and Oman in mid- to late April 2012. News reports blamed the floods for damaged buildings, washed out roads, 18 deaths, and about 12 people missing. As of April 21, police and air force personnel were engaged in search-and-rescue operations. The Moderate Resolution Imaging Spectroradiometer (MODIS) on NASA's Terra satellite observed evidence of flooding along the borders between Saudi Arabia, United Arab Emirates, and Oman in April 2012. MODIS captured an image on April 9 and on April 18. These images use a combination of visible and infrared light to better distinguish between water and land. Water appears in shades of blue-green, and bare ground appears in shades of pink-beige. Isolated clouds appear in pale blue-green and cast shadows. The images from April 18 [below] showed large areas of water and wet sand extending from southeastern Saudi Arabia into western Oman. In addition, Umm as Samim (or Umm al Samim), a salt pan in Oman, apparently holds more water on April 18. This region includes part of the Empty Quarter or Rub' al Khali. In this vast sand sea, salt flats often separate towering dunes, and much of the water visible on April 18 probably rests on those flat areas. Some of the salt flats are paved with roads, and standing water left at least one of those roads impassable. The flood water might have flowed into the region from the southwestern Empty Quarter, and from the mountains of Oman. Ground water often feeds perennial lakes in this region, and in April 2012, Umm as Samim might have been both a destination for flood water flowing over the surface and a source of upwelling ground water. Few people associate the Empty Quarter with heavy rain, but G. Robert Brakenridge of the Flood Observatory at the University of Colorado explains: "Flooding is actually surprisingly common, despite how arid the region is, and is often deadly." Brakenridge produced a flood map of this region, covering April 16-25, 2012. Blue and green shown in this NASA photo, is where the ancient lake bed in the Empty Quarter in April 2012, was starting to see some moisture accumulating from the unusual rainfall. The Umm as Samim is the lowest point of the ancient lake bed, that was once covered with water over 100 meters deep. Flood events Arabian peninsula, by month, 2002-2010, from Dartmouth Flood Archives. Below, shows the monsoonal clouds on July 28, 2010, looks like a fist at the end of an arm over the Arabian peninsula, breaking through the heat/dust barrier, during the Pakistan floods. Left: Nice native perennial grass cover with shrubs at 24N 31E. Photo from the Confluence project. Right: THE VERY BEST example of native acacia/grassland habitat in the Kingdom of Saudi Arabia so far. This shows the potential, what the Arabian peninsula could look like after a program of annual ecological restoration is begun. Photo from the Confluence Project, taken at 18N 42E. Using ground photos taken around the Arabian peninsula, it would be possible to evaluate the potential for ecological restoration at various points, by viewing the current conditions of the natural vegetation, soils, etc. See evaluation of the Sultanate of Oman for ecological restoration potentials. WHERE IS ALL THIS ATMOSPHERIC HEAT COMING FROM? It is generally known that carbon dioxide and other greenhouse gases trap heat in the atmosphere, but how did the heat get there in the first place? Some of that heat is reflecting off bare soil in hot, arid areas. Looking at the images below, you can see that the Arabian peninsula contributes about 1/5th of the heat coming off the planet's land surfaces. Above, another method is to look at the global surface temperatures, like the May 1994 image from www.nasaimages.org at NASA/Goddard Space Flight Center Scientific Visualization Studio, where the bare soils of desert regions are lit up blazing hot. THE HOT-ARID AREAS OF THE WORLD are major contributors of heat towards global warming of the planet, whether they are in Afghanistan, the Arabian peninsula, or the Mojave and Sonoran "desert" areas of the United States. These bare arid areas, which were formerly perennial grasslands, and unfortunately also act as the shut-off valves in the world's precipitation cycle. Ecological restoration of these areas could be the easiest and fastest-acting action to help mitigate global warming, and could help in the flow of a global rainfall cycle, that the northern hemisphere crop lands depend on. DEW POINT? What is dew point? It is the air temperature when water precipitates out, either as rain, snow or as dew. What happens when the night-time dew point temperatures rising even a few degrees? There's been much talk about the global maximum temperatures rising, due to global warming. However, if nighttime temperatures raise even a few degrees above the dew point, then precipitation doesn't fall, and that is probably what is keeping the monsoon rain from falling in the summer in the Middle East and North Africa. (1.) PLANT CITIES WITH NATIVE SHADE TREES. Planting the cities of the Arabian peninsula with native shade trees, like the native Acacia, and other native Arabian trees that do not need irrigation to thrive. (2.) NO GRAZING AROUND CITIES. Eliminating any grazing of rangelands within a 50 mile (30 km) radius around each city. (3.) ECOLOGICAL PRESERVES. Establish permanent Ecological Restoration preserves in the Empty Quarter and other barren parts of the Arabian peninsula, and begin the densely replanting of the local native perennial grasses, forbs, wildflower and native trees to shade the bare soils in the summer. No grazing allowed within Ecological Restoration preserves, but mineral or oil development continues in those areas. (5.) ELIMINATE ATMOSPHERIC DUST. Sow local native plant seeds around the towns and cities, to cover the soil surface with as much native vegetation as possible, to lower the amount of dust blown into the atmosphere, and the roots act to absorb the rainfall to eliminate flash floods. (6.) INSTALL SOLAR PANELS on every flat-roofed building around the Middle East, to shade the buildings and cooling their roofs so they do not reflect the heat of the roofs back into the atmosphere, plus cutting back on the "heat-island" effect that cities produce, shade of the panels cooling the buildings, plus capturing the solar energy to produce electricity. Also cover all of the large car parking lot, to shade the pavement and the parked cars. (7.) RELOCATE BUILDINGS out of the bottom of wadis, and preserve the bottoms as public open spaces or parks, and replant the wadi bottoms with native wetlands vegetation, to slow down any torrential rains water flows, and in anticipation that the rivers will start flowing again. These public parks and open spaces at the bottom of the wadis, will give the waters from rainstorms a place to flow, without danger to lives or property. Like the ten year restoration project of Wadi Hanifah in south Riyadh, written about in Saudi Aramco World January/February 2012. (8.) BUILD STORM DRAINS and DRAINAGE CANALS and sewage systems for all Arabian peninsula cities, and build all the sewage system so that they are completely separated from the storm drain system. Mentioned in the Reuters 2011 article about the January 2011 Jeddah floods. (9.) CONVERT a portion of the MILITARY BUDGETS to Ecological Restoration? It does not make sense to spend huge amounts on military budgets, to guard a degrading environment that is becoming more and more inhospitable for human life? When the countries of the Arabian Peninsula start investing in Ecological Restoration of their lands, then at least the lands will become more livable--Getting more regular annual rainfall, eliminating dust storms, slowing down the torrential rains and floods, lowering the summer maximum temperatures, having the grass and trees grow again, and the rivers flow again, after a 5,000 year absence. (10.) VISITOR DONATIONS TO PLANT NATIVE SEEDS and NATIVE PLANTS? The Arabian peninsula has over nine million visitors each year, just in the KSA for the Hajj, Ramadan and for Umrah. What if Ecological Restoration of Arabia, to help the native grasses and native trees grow and the streams and rivers to flow, was something that the visitors could make a donation towards? When the dew point is within a few degrees of your air temperature, then you can get precipitation. The already existing low pressure area sitting over the Middle East from spring to fall, combined with a change in the dew point, you have the potential of a whole lot of rainfall. By making an investment in modifying the ecological conditions of the land with revegetation, you could change the dew point, so precipitation could start to occur, after a 2,000-6,000 year absence. NATIVE PERENNIAL GRASSES> INSULATE the soil in the daytime from the sun's heat> LESS solar heat is absorbed> LOWER daytime and night time air temperatures> DEW POINT gets close to air temperature = RAINFALL. --Should it be raining in Arabia or North Africa today? A.) Water vapor absent--very low possibility of rain. A.) Above 30.10 inches, close to zero possibility of rainfall, and strong winds, dust storms possible. B.) Below 30.00 inches, better possibility, but weather usually calm at this pressure. Using Jeddah as an example above, for DEW POINT. A.) Dew point, more than 10 degrees F. away from the air temp., probably no rainfall, and possibility of strong winds and dust storms likely, the further away the barometer is below 29.85". B.) DEW POINT is within 1-5 degrees of the air temp, it should be raining, like shown in the chart above. A.) If DUST is present, that can be a huge factor interfering with rainfall/cloud formation.The lowest concentration of dust that the NAAPS image shows, >20ug/m3, is robust enough in summer to interfere with monsoon cloud formation and rainfall. If it should be raining according to the local barometric pressure or dew point, check for atmospheric dust as a factor, keeping the clouds or rain away. (5.) CREATING CLOUDS and RAINFALL. Therefore, if water vapor is present in the area, and the barometer is below 29.80", and it is not raining--then it could be raining if the dew point could be improved so that it falls within 1-5 degrees of the air temperature--For example, if the amount of atmospheric dust could be lowered. SLOWING DOWN THE WINDS TO CREATE MORE RAINFALL? Barren areas of the planet, allow the winds to blow without anything to slow them down. Any type of vegetation, acts like a spring, and absorbs some of the wind energy. When you slow down the winds, then any clouds that could produce rainfall, have a chance of lingering longer and dropping more rainfall in an area. This could be accomplished with vertical mulch, where all grazing lands are left with at least a few inches of stubble, instead of grazing the whole area to the ground level. PLANT BACTERIA HELPING THE CLOUDS TO PRODUCE RAINS. Discover magazine, "The Clouds are Alive" article by Douglas Fox, in the April 2012 issue, pages 38-44 reports that the bacteria Pseudomonas syringae that lives on plants, when it moves into the upper atmosphere, has a protein on its surface that helps form ice crystals which helps clouds produce rainfall. the emirate's summer months. This $11 million project, reportedly commissioned by HH Sheikh Khalifa bin Zayed Al Nahyan, President of the UAE, used ionisers to generate storms, producing rainfall on 52 days when the country's own weather service had predicted no clouds and no rain. Title: "Design for a New Flag, for one of the desert countries located between India and Morocco, to start to harvest the summer monsoonal moisture that is passing over each season, by replanting the local native trees like the Acacia shown in the image, plus replant and protect the local native perennial grasses, to cool the soil surface, lower the atmospheric dust, and encourage the clouds to form, the rain to fall, and the streams to flow again." Digital image, taken from the 8" x 10" acrylic on canvas. Painting #20 in catalogue. Copyright image and text © 2012 by Craig Carlton Dremann, all right reserved. 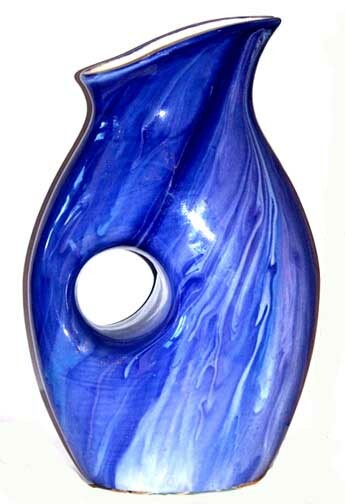 Title: "Arabia's ancient rivers are about to flow again, after ecological restoration of the native grasses, wildflowers and trees begins, and this vase is created to hold and celebrate the return of the blooming wildflowers that live again after a 6,000 year absence." text © 2012 by Craig Carlton Dremann, all right reserved. Title: "WHEN RIVERS FLOW AGAIN in Arabia, a vase to dip into that lovely, life-giving water that has been missed for 5,500 years." Cermaic vase, 5" x 8" artifact #42 in catalogue. Copyright image and text © 2012 by Craig Carlton Dremann, all right reserved. GOAL of One Billion Acres of Native Vegetation Sunscreen & Carbon banks? What is the possibility of setting aside barren arid lands as Ecological Restoration preserves, and replanting the local native perennial grasses and native trees, to act as a natural sunscreen, to shade the bare earth from absorbing the sun's heat? What if this native plant sunscreen could be applied to one billion acres worldwide? And could those areas be utilized, to sequester atmospheric carbon in the soil? Website: (http://www.iucn.org/themes/wani/eatlas/html/gm10.html) - "[Map] 10 - Dryland Area by Basin Watersheds of the World : Global Maps"---IUCN -The World Conservation Union.---"Drylands, because of their extensive area, can store large amounts of carbon, most of it in the soil rather than in vegetation. Improving the carbon storage capacity of drylands may be one method to help offset global warming by lowering CO2 concentrations in the atmosphere." Luske, Boki and van der Kamp , Joris (2009) Carbon sequestration potential of reclaimed desert soils in Egypt. The objective of this study was to investigate the carbon storage potential of reclaimed soils under organic management. Agricultural soils are often mentioned as a potential carbon sink. However, until now the UNFCCC (United Nations Framework Convention on Climate Change) does not issue certified emission reductions (CERs) for carbon sequestration in soils. This research focuses on carbon stock development of reclaimed desert soils in Egypt. The research was conducted on two farms owned by Sekem, one of which located 60 km north-east of Cairo, and the other one in the Sinai desert. Five agricultural fields of different ages (1-30 years in use) were selected and compared with the surrounding desert. In every field, representative soil samples were collected from 3 line transects, each consisting of 5 sample points. The samples were taken at three horizons; 0-10 cm, 10-30 cm and 30-50 cm, and tested for differences in physical (soil texture and bulk density), and chemical (acidity, salinity and organic carbon levels) properties. The results show that reclaimed desert soils under organic management sequester carbon very rapidly in the first few years after land reclamation, but that this rate decreases after several years, following a logarithmic curve. The increase in soil carbon was first measured in the top soil (0-10 cm) and then in deeper soil layers. The bulk density of the top soil layer decreased at the same time. The results show that in 30 years of organic agriculture, the soil carbon stock increased from 3.9 to 28.8-31.8 tons C/ha, a raise of ca 24.9-27.9 t C/ha. On average, the soil stored 0.9 t C/ha/y in these 30 years. Thus, an atmospheric CO2 reduction of 3.2 tons CO2-equivalents per ha per year had taken place. BASE MAP: The World" 1998 scale 1:30,000,000 at the equator, published by the Dept. of Defense, National Imagery and Mapping Agency. Distributed by the US Geological Survey. DISCOVER magazine, July 1993 article "A river in the desert - Remote sensing photo locate ancient river in Arabian peninsula". DISCOVER magazine, April 2012 article, "The Clouds are Alive" by Douglas Fox, pages 38-44. Eltahir, Elfatih. website: Pilot Study on Biosphere - Atmosphere Interaction in Dhofar MIT study of rainfall/vegetation connection around Salalah, Sultanate of Oman. Thompson, Lonnie G. et al. 2002. Kilimanjaro Ice Core Records: Evidence of Holocene Climate Change in Tropical Africa. SCIENCE. 298: 589-593. Van Campo, E. et al. 1982. Climatic conditions deducted from a 150-kyr oxygen isotope-pollen record from the Arabian Sea. NATURE March 4, 1982, 296: 56-59. Website: http://southport.jpl.nasa.gov/ProgressReports0496/Dabbagh.Final.html Dabbagh, Abdallah E. et al. 1996. "Geologic and Hydrologic Studies of Saudi Arabia Under the Spaceborne Imaging Radar-C (SIR-C) Science Plan." Website: NASA/Goddard Space Flight Center Scientific Visualization Studio, for global surface temp. Webpage: http://www.ecoseeds.com/salalah.html images of Salalah, Oman. Webpage: http://weather.noaa.gov/weather/SA_cc.html for dew points, and barometric pressure was decommissioned August 3, 2016. Webpage: http://www.nrlmry.navy.mil/aerosol/index_frame.html for atmospheric dust. Website: http://www.ecoseeds.com/Saudi_2006_vapormov.gif for movie of 2006 vapor. Website: http://southport.jpl.nasa.gov/ProgressReports0496/gifs/dabbagh11.gif "Figure 11 - Pleistocene drainage of Arabian Peninsula." Website: http://www.museum.upenn.edu/new/exhibits/galleries/ram/ramconservation5.shtml --Photo of "Ram in Thicket", Museum of the University of Pennsylvania, the story of its conservation. Website: http://www.drought.unl.edu/dm/monitor.html shows the drought impact on the United States when the global summer precipitation has been blocked upstream. Website: http://www.ssec.wisc.edu/data/comp/latest_cmoll.gif , Univ. of Wisconsin's Land & Oceans Temps. Website: http://cimss.ssec.wisc.edu/tropic/real-time/indian/images/xxirmet5bbm.jpg , University of Wisonsin's Indian Ocean satellite view of monsoon moisture. Website: Dartmouth Flood archives for flood event data. Website: http://www.helmink.com/Antique_Map_Ruscalli_Arabia/ Ptolemy"s map of Arabia. Website: http://geology.com/world/saudi-arabia-satellite-image.shtml , composite of NASA Landsat images of Saudi Arabia. Website: http://www.museum.upenn.edu/new/exhibits/galleries/ram/ramconservation5.shtml stature from Ur. Website: http://www.cdc.noaa.gov/map/images/olr/olr.seasonal.gif - Outgoing radiation. Website: http://www.cdc.noaa.gov/map/images/fnl/olr_90.fnl.anim.html - Outgoing radiation movie. Website: Website taken down = http://eob.gsfc.nasa.gov/Newsroom/NewImages/images.php3?img_id=4900 - NASA Earth Observatory, "Central Sarah: A Wet Past"
Website: http://earthobservatory.nasa.gov/NaturalHazards/view.php?id=44217 image of Cyclone Phet. Contact: Craig C. Dremann, Director of The Reveg Edge, Box 361, Redwood City, Ca 94064 USA email (650) 325-7333, Web = http://www.ecoseeds.com/greatbasin.html to see photos of an arid grassland restored. Developing licensed native grassland restoration technologies since 1972.